You must have seen the orange colored growth on spoiled corn, the gray to black or white spots on a three-day old bread left in a warm and humid or moist place. Or the kabuti, that your father gathered from the woods and yeast used in making bread. All these are fungi. Fungi are classified according to the fruiting structure that they exhibit. 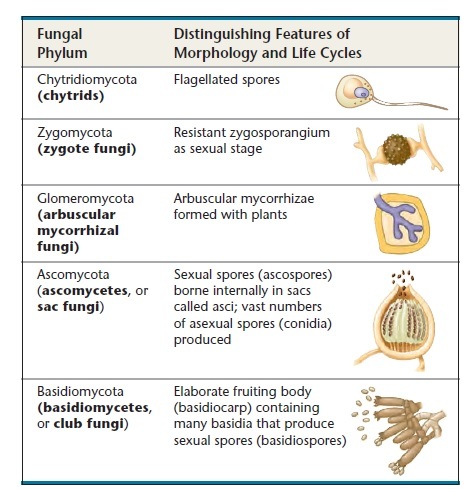 Following are the fruiting structures of different fungal representative. Observe the structure, determine what kind of spore they produce. When a fungus forms a symbiotic association with a green or blue green algae, LICHENS are formed. Following are varied lichen growth forms that you may see attached to your tree barks. They are known to be an indicator of the environmental condition, specifically an indicator of air condition. ​1. Why are molds considered to be harmful to humans? 2. How do yeasts reproduce asexually? 3. Where are mushroom spores produced? How do we group organisms?